The occurrence of infections by Dirofilaria immitis in canine and human populations depends on several factors linked to both the definitive and intermediate hosts. Little data are available on the risk of human and dog exposure to D. immitis in endemic areas. Data collected on dog- and human-bait traps in endemic areas of north-eastern Italy were used to estimate the likelihood of a receptive host coming into contact with an infected vector. From 1997 to 1999, mosquitoes were collected from three sampling sites of north-eastern Italy on D. immitis microfilaraemic dogs and on human baits. The bite/night/host rates were determined based on the number of feeding and probing mosquitoes on dogs and humans, respectively. The survival/mortality rates of different species of mosquitoes following the blood meal, and the rate of natural Dirofilaria infection in unfed specimens were estimated. The risk of exposure of dogs and humans to infected mosquito species was determined by combining the bite/host/night and the mosquito infection rates. A total of 1,165 mosquitoes were collected on human (n = 815) and dog (n = 350) baits with varying species composition (i.e., Culex pipiens, 87.3% and Ochlerotatus caspius, 11.6%). Overall, dogs were more attractive to Cx pipiens than humans (feeding rate 70.2% vs probing rate 25.9%). The highest bite/night/host rate was 84.0 for dogs and 26.5 for humans. Cx pipiens displayed a mortality rate of 76.3% within 13 days and Oc. caspius of 100% within two days following the infective blood meal. In addition, D. immitis DNA was detected in unfed Cx pipiens (infection rate of 0.26%-2.07%). The infection rate adjusted for mosquito mortality was 0.38%. Based on data collected, the contact between an infected mosquito and a host can occur as often as every four nights for D. immitis infected-mosquitoes in dogs and within two weeks for humans. Cx pipiens was confirmed as the most efficient natural vector of D. immitis in the studied area. In endemic areas, the risk of transmission can be very high for dogs and relevant for humans. Despite the increased awareness of veterinarians and owners on canine dirofilarioses, dogs from rural areas still maintain the natural life cycle of Dirofilaria spp., therefore acting as a source of infection to humans through vector bites. Dirofilaria immitis (Filarioidea, Onchocercidae) is responsible for cardiopulmonary dirofilariosis. This filarioid is transmitted by many species of mosquito vectors (genus Culex, Aede s, Ochlerotatus and Anopheles), in which it develops into the infective third stage within different timeframes, which depend upon several factors [1–4]. Among vector-borne helminths, Dirofilaria spp. have been recognised as emerging zoonotic agents, currently spreading throughout Europe [5, 6]. The risk of canine and human infection by D. immitis is linked to a combination of several factors related with both the definitive and the intermediate hosts. For example, the rates of infection in the intermediate host depend on vector densities, host-seeking activity/feeding preference, and vector competence [4, 7, 8]. Mosquito species of the genus Culex and Ochlerotatus have been reported as major vectors of Dirofilaria in Italy and other European countries [3, 9, 10]. Current data on the vectors of Dirofilaria spp. derives from laboratory experiments, occasional findings in naturally infested insects, or from fieldworks using dogs and/or humans-bait traps . In these studies, the rate of mosquito infection has been estimated by insect dissection or biomolecular methods. Nevertheless, the risk of dogs and humans to be exposed to D. immitis infected vectors in endemic areas, has never been investigated. In the present study, data on risk for dog and human exposure to D. immitis infected mosquitoes in endemic areas of Italy have been examined and discussed. From 1997 to 1999, nocturnal mosquito collections were carried out in lowland areas of north-eastern Italy, endemic for dirofilariosis [5, 6, 10]. Dog- and man-attracted mosquitoes were collected in three peri-urban sites, i.e. Rodeano (site A; province of Udine, Friuli Venezia Giulia region; 46°06'43"N −13°00'13"E, 130 m above sea level [a.s.l. ]), Piove di Sacco (site B; province of Padua; Veneto region; 45°17'49"N–12°02'06"E, 5 m a.s.l. ), and Sarzano (site C; province of Rovigo; Veneto region; 45°04'50"N–11°49'38"E, 5 m a.s.l.). The mosquito collection started in each site when a minimum temperature of >15°C was recorded, and terminated at the end of September of each year. Microfilaraemic dogs naturally infected by D. immitis (i.e., a 7 year old male pure-breed dog (Bobtail), in site A; a 5 year old male cross-breed dog (medium size), in site B; and a 6 year old male cross-breed dog (small size), in site C), were used as bait in each sampling site. Average values of microfilaraemia, expressed as number of microfilariae per milliliter (mf/ml), were calculated by ten counts serially performed on 10 μl of blood samples collected from each dog at the beginning and at the end of the study. Mosquitoes were also collected while landing on two persons. The same persons were employed in site B and C, whereas one of the two persons was replaced in site A. One dog- and one man-bait trap were employed simultaneously in the three sites for 17 sampling nights, i.e., for six nights in site A (August 5-September 15, 1997), six nights in site B (July 29-September 23, 1998), and five nights in site C (June 23-September 15, 1999). 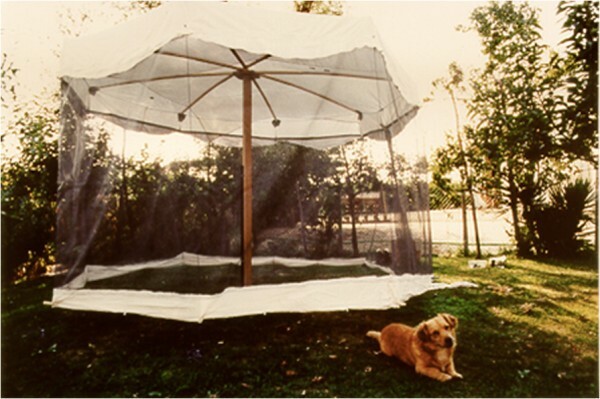 The traps consisted of a cylindrical structure of wood (2.3 m of diameter × 2.0 m in height for dog and 2.0 m × 1.5 m for humans) covered by a net, five cm above the ground to allow mosquitoes to enter the trap [12, 13] (Figure 1). The risk of mosquitoes escaping from the trap was considered negligible, due to both the insect host-seeking behaviour (in which mosquitoes rarely fly downwards when leaving an enclosed space), and to the fact that engorged females do not move after the blood meal, resting on the net . In each site, the human and dog baits were located at a distance of at least ten meters to avoid interference between mosquito attractants. Dog bait trap (site C). Mosquito collections were performed using a paper cup aspirator  from 8:00 p.m. until 6:00 a.m. In dog-bait traps engorged insects resting on the net were collected every two hours. Unfed mosquitoes were left in the traps until the last sampling (6:00 a.m). 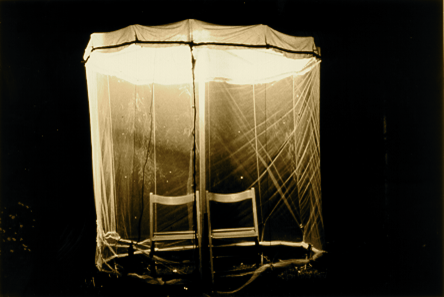 Mosquitoes were collected by using the above procedures in the human-bait traps, with two persons acting as bait and collectors, simultaneously. Only mosquitoes attempting to probe on humans were collected. The mosquitoes were identified according to morphological keys . The unfed mosquitoes collected in dog-bait traps and all the mosquitoes collected in human-bait traps (probing and resting on the net) were pooled (minimum 1 - maximum 12 specimens) according to species, date and site of collection. The numbers of human-probing mosquitoes and of dog-fed specimens were used to evaluate the bite/night/host rates. Alive dog-fed insects were kept under standard insectary conditions (25–27°C, ∼90% relative humidity) for 13 days, and observed daily in order to estimate the mortality rate after the microfilaraemic blood meal . The DNA was extracted separately from pools of the insect abdomens and thorax-heads, respectively, in order to detect potentially infective specimens . The pooled samples were analysed by PCR amplification with D. immitis and D. repens specific pair of primers (R1-R2, and I1-I2, respectively) as previously described . All sequences generated were compared to sequences available in GenBank using standard BLAST searches. The procedures for sampling mosquitoes attracted to humans and dogs followed a standard protocol . At the time of the study, in absence of any Ethical for Animal Experimentation Committee at the University of Padua, the study was performed according to the legislative decree n. 116 (27 January 1992), implementing the Council directive n. 86/609/EEC on the protection of animals used for experimental purposes. All humans involved in the field study were staff employed by the Faculty of Veterinary Medicine of Padua and provided their informed consent to all components of the study. Since in human bait traps two persons collected mosquitoes while probing and not following feeding, the infection risk with any pathogen was considered negligible. The dogs used in the study were naturally infected by D. immitis and were usually kept outdoors during the night. Dogs were neither anesthetized nor forced under the traps, which were placed at their usual sleeping site. The dog owners declared their unwillingness to treat them against dirofilariosis. However, a free treatment was offered to dogs at the end of the study. The differences among the proportions of mosquitoes that fed on dogs or landed on humans were tested by the chi-square test or the Fisher exact test when appropriate . The mean numbers of different mosquito species captured on dogs and humans were compared by ANOVA, after loge (× + 1) transformation of the data (software SPSS, version 13.0 for windows). ERI = 1-(1-n/N)1/k, where n is the number of positive pools, N the number of examined pools, and k the average number of specimens in each pool . Before calculating ERI for D. immitis the positive pools detected from the pooled mosquito abdomens (infected and not still infective) was adjusted with the mean mortality rate found in reared Cx pipiens. The ERI calculated in this study was used for site C, while the ERI estimated in a separate study performed in the same area in 2010  was used for site B. No data on mosquito ERI is available for site A. The risk of exposure was expressed as “risk in days” (i.e., the minimum number of nights of exposure necessary to come in contact with an infected mosquito under the specific epidemiological conditions of each site at each data time/point). Therefore, the shorter the time, the higher the risk of contact. The dogs trapped in site A, B and C displayed a microfilaraemia of 30–35,000; 100–110,000 and 110–125,000 mf/ml, at the beginning and at the end of the study, respectively. Of the 1,165 mosquitoes captured on host-baits (i.e., 350 on dogs and 815 on humans) the most represented species was Culex pipiens (n = 1017; 87.3%), followed by Ochlerotatus caspius (n = 135; 11.6%), Cx modestus (n = 5; 0.4%), Coquillettidia richiardii (n =4; 0.3%) and Aedes vexans [Aedimorphus vexans] (n = 4; 0.3%). The latter two species were captured on humans only (Table 1). a Two persons per trap. Statistically significant differences are marked (*) (p < 0.01). Although the mean number of mosquitoes per dog/human which entered the traps did not differ significantly, the rate of Cx pipiens that fed on dogs was more than double that of mosquitoes probing on humans (i.e., 70.2% vs 25.9%; p < 0.01) (Table 1). The same tendency (p = 0.053) was observed for Oc. caspius (i.e., 90.0% vs 68.9%) in site C (Table 2). (*) equal letters correspond to significant difference, p < 0.01 (uppercase = comparison within the same host species at the three sites, vertical; lowercase = comparison among dog/humans at the same site, horizontal). (§) landed and total number of mosquitoes collected per person. The attractiveness of Cx pipiens to dogs and humans varied significantly within the same host species (Table 2). Specifically, the feeding rate of mosquitoes feeding on dogs at site B was higher than that recorded on the other two dogs (i.e., 97.5% vs 38.6 at site A and 46.4% at site C). In addition, the two persons at site A were more attractive (landing rate of 44.4%) than the ones at sites B and C (i.e., landing rate of 16.8% and 21.2%, respectively) (Table 2). The overall mortality rate of fed Cx pipiens 13 days following collection was 76.3%. In particular, of the 148 mosquitoes, 95 (64.2%) died spontaneously within one week (Table 3). Mortality rates varied among sites with the highest rate (i.e., 91.3%) recorded in mosquitoes which fed on the dog from site C (i.e., the animal harbouring the largest number of microfilariae) (Table 3). However, a variation of mf density throughout the study period cannot be excluded. a Microfilaraemic values detected at the beginning and at the end of each mosquito collection. Oc. caspius specimens, collected only at site C, died within two days (data not shown). Out of the 915 unfed mosquitoes processed by PCR, eight pools of Cx pipiens from site C were positive for D. immitis, one in thorax/head pools and seven in abdomen-pools, corresponding to an estimated rate of infection (ERI) of 0.26% (95% CI 0.01-1.2) and of 2.07% (95% CI 1.03-4.11), respectively. After adjustment for mortality, the overall ERI for site C was 0.38%; this value was used to estimate the risk of exposure to a D. immitis infective Cx pipiens at the same site. Conversely, the risk of exposure to D. immitis at site B was calculated using the ERI recorded in a study performed 10 years later in the same area . For site A no data on mosquito Dirofilaria spp. rate of infection is available. Based on this data, and according to biting rates and ERI recorded at different sites (Table 4) the risk for dogs and humans to be exposed to D. immitis infected Cx pipiens could range from a minimum of four to a maximum of 300 days and a minimum of 12 to a maximum of 901 days, respectively (Table 4). (*) ERI = estimated rate of infection. For site C, ERI was calculated in this study and adjusted for Cx pipiens mean mortality; for site B, ERI is from . (§) minimum number of days to come in contact with a D. immitis infected mosquito. The results of this study contribute to current understanding of the epidemiology of Dirofilaria spp. in an endemic area of north-eastern Italy. Based on the dog/human attractiveness, on the survival after feeding on dogs with high microfilariae concentrations and on the overall rate of positive mosquitoes, Cx pipiens was the most efficient natural vector of D. immitis in the studied area, where highly microfilaraemic dogs are expected [7, 23]. Although the small number of Oc. caspius collected does not allow any definitive conclusion to be drawn, the high mortality rate of this species following a blood meal on a highly microfilaraemic dog indicates that Oc. caspius might be an effective vector in non-endemic areas. Indeed, the survival of different vectors was linked to Dirofilaria microfilariae concentration in the mosquito species . The results also indicate that in north-eastern Italy, where Cx pipiens is most prevalent , the risk of exposure to Dirofilaria spp. infected vectors can be very high for dogs and relevant for humans. Indeed, based on our calculations, during the seasons characterized by higher biting pressure, the contact between an infected mosquito and a host may occur as often as every four nights for D. immitis in dogs, whereas the possibility for a human to come into contact with an infected mosquito occurs within two weeks of exposure. The higher risk of Dirofilaria spp. transmission was recorded in late July and August, in accordance with previous reports . In contrast, in a study in which more than 40,000 culicids collected from May to October 2010 in the areas of site B and C were screened for D. immitis and D. repens, the rates of Cx pipiens infection did not vary significantly through the season, indicating that over spring a certain number of dogs may act as a source of infection to suitable vectors. This finding indicates that the mosquito abundance is one of the key factors in the epidemiology of dirofilariosis. Interestingly, the rate of Cx pipiens infection with D. immitis estimated in this study in 1999 (0.26%-0.38%, site C) was very similar to that calculated more than ten years later (0.21-0.33%) . This finding shows that, in spite of the availability of several chemoprophylactic treatments used for the prevention of canine dirofilarioses in endemic areas, prevalence of microfilaraemic dogs has not decreased significantly in rural areas. However, since the most conservative approach was used to infer the risk of host exposure to D. immitis (i.e. assuming that mosquitoes harboring microfilariae in the abdomen would have suffered the same rate of mortality of Cx pipiens fed on high microfilaraemic dogs, 76.3%), is likely that in certain sites, the risk of exposure of dogs and humans is higher than indicated. In addition, due to the introduction of Aedes albopictus [Stegomya albopicta] in Italy as well in other European countries  the risk of Dirofilaria transmission is higher throughout the day time, as a consequence of the fact that this species is diurnal and it acts as natural vector of both filariae in Italy [9, 27]. Consequently, categories of dogs and humans previously considered not at risk for dirofilariosis (e.g., animals kept indoors at night or children playing in private and public gardens), should be included in the population at risk of exposure. Without any doubts, host attractiveness plays a key role in the determination of the population at risk of exposure. Indeed, mosquito host preferences have been well documented, both at species and at individual level . Accordingly, in the present investigation, Cx pipiens fed preferentially on dogs (70%) than on humans (26%), and was differently attracted by the three dogs used in the study, independently from their sizes. Besides the individual host attractiveness to mosquitoes, the microfilaraemic status of the dogs may enhance the host-preference of Cx pipiens. Accordingly, Cx pipiens displayed a higher feeding rate on a microfilaraemic dog, compared to a dog under preventative treatment (i.e., 47% vs 6.7-12.9%) . Similarly, the mosquito host attractiveness is also enhanced in human patients infected by Plasmodium spp. [29, 30] indicating that alterations of the physiological status (disease conditions) and consequently of physiological parameters, may ultimately change the animal cue attractants (fever, sweat and breathing rhythm and odour) to competent vectors. Although these factors might have an impact on the spread of the infection, they remain purely speculative for dirofilarioses. The quantification of the most important entomological parameters (i.e., mosquito host preference, biting rate, mortality induced by the pathogen, rate of infection), which affect the risk of transmission of a vector-borne disease to a susceptible host population, is pivotal for the estimation of the dog/human exposure to infected bites. Data herein presented on the Dirofilaria spp. transmission from arthropod to vertebrate host, and vice versa, are of importance for setting prediction models of dirofilariosis in animals and human beings in a given geographical area. The similarity in the mosquito infection rates recorded over a period of ten years suggests that, in rural areas, dogs maintain the natural cycle of Dirofilaria spp., which enhances the risk of transmission to humans. Therefore, strategies to minimize the contact between animal/humans and vectors are strongly recommended. Authors wish to thank Dania Gaglio for her help in collecting mosquitoes in dogs and humans bait traps and Cinzia Cantacessi for revising the manuscript. Authors declare that they have not competing interests. AFR and MP conceived the study and performed the field collections, AFR, GCap and DO wrote the manuscript, GCan performed the biomolecular analyses, RC, GS and SC participated to the field and laboratory analyses, GCap performed statistical analyses, all the Authors read and approved the final version of the manuscript.